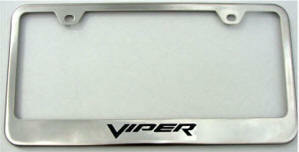 Heavy duty, high quality, high polished stainless steel License Plate Frame designed to fit the narrow plate well on the Dodge Viper SRT10 years 2003-2010. Fits Coupe or Convertible. Will Never Rust. Includes four chrome resin caps. Your choice of color vinyl sticker logo. (6 1/4" high frame.) 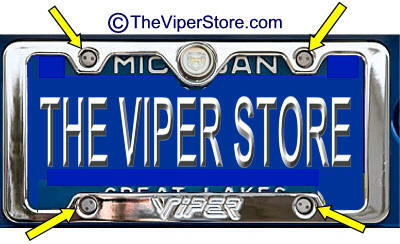 With Black "VIPER" or "VIPER TRUCK" logo. 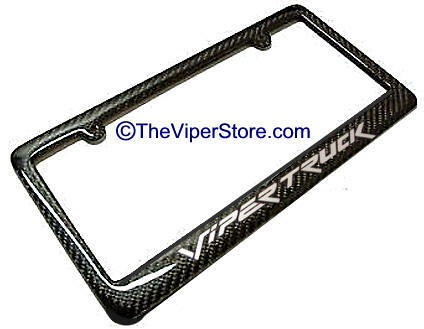 Heavy duty, high quality, black powder coated, stainless steel License Plate Frame designed to fit the narrow plate well on the Dodge Viper SRT10 years 2003-2010. Fits Coupe or Convertible. Will Never Rust. 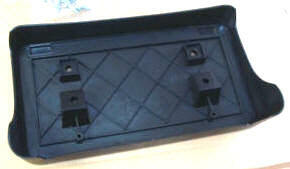 Includes four black resin caps. 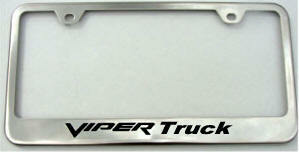 With CHROME "VIPER" or "VIPER TRUCK" logo. 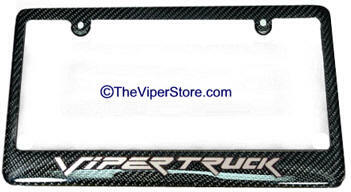 Heavy duty, high quality, 100% real Carbon fiber Frame designed to fit the narrow plate well on the Dodge RAM SRT10. Includes four black resin caps. Your choice of color vinyl sticker logo. (6 1/4" high frame.) 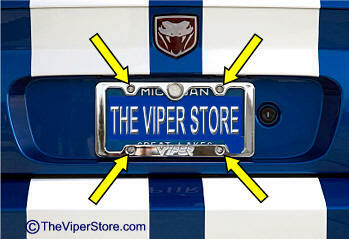 With CHROME "VIPER", "VIPER Powered" or "VIPER TRUCK" logo. 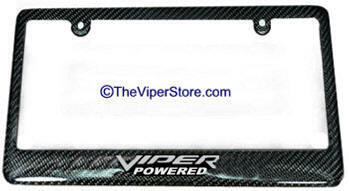 Secure your custom license plate and frame! Highest quality Locks you can buy. Lock your expensive custom license plate frame down. Requires special bit (included) to unscrew each screw. 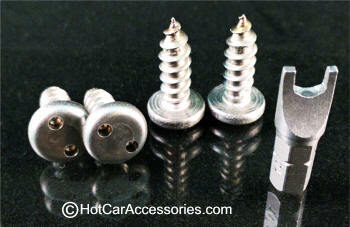 Includes set of 4 plus lock inserts plus unlocking bit. 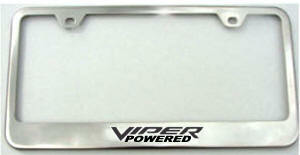 Secure that expensive license plate frame! 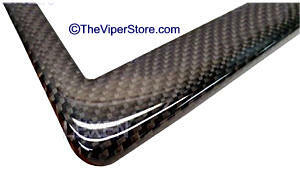 This is the factory OEM bracket designed for the dodge RAM SRT-10 to hold a state or vanity license plate. 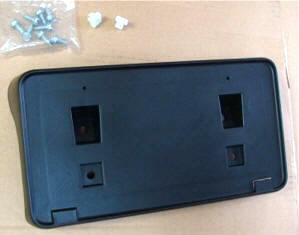 You will need to drill holes in your truck to attach this bracket plate. Screws not included. This item is one bracket plate.